What does Jonny McCoy, the Pizza Project founder, think makes our pizzas taste so amazing? Hear directly from the man himself! Whenever anyone asks me what my favourite pizza is, my answer is always the same: I love margherita. Simple, I know. But, made well – with fresh basil, soft dough, tangy tomatoes and creamy cheese – and cooked to perfection in a wood-fired oven, there is nothing quite like it. Since I first learnt age-old Neapolitan pizza-making skills from the Italian National Pizza College, I have been driven by a love of simple, authentic pizza that tastes incredible. Here’s how our pizza caterers make our wood-fired pizzas taste so good. For me, the dough is everything. A soft, springy and well-risen dough that lovingly hugs the delicious fresh toppings is the true indicator of an amazing pizza. At The Pizza Project, our tasty handmade dough enjoys a luxurious 48-hour prove, so that it is beautifully elastic and rises perfectly when cooked. Sometimes, we let it prove for up to three days! Ours is thinner than a classic Neapolitan dough, as we think this lets our ingredients truly shine through and makes our pizza beautifully light. 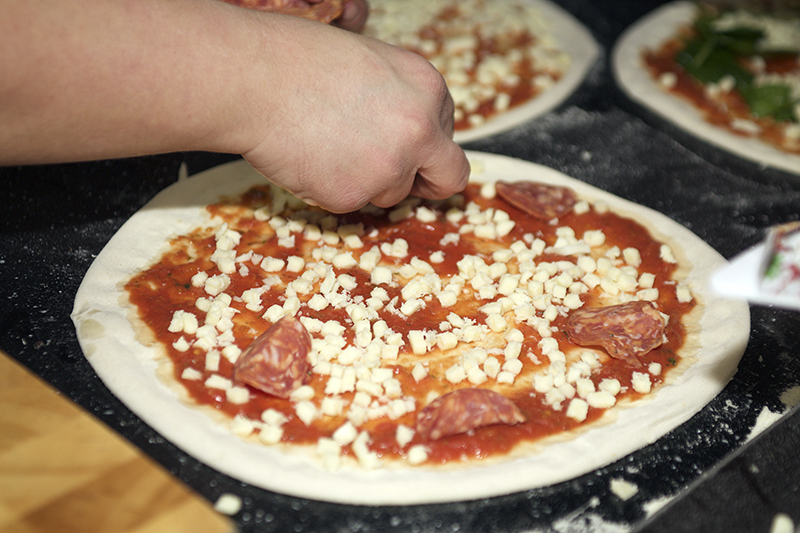 All our pizzas are hand-stretched and created fresh to order, which is key to achieving that amazing rustic taste. This is something we’re incredibly proud of, which is why we make our pizzas in front of our customers, whether we’re serving pizza at weddings or cooking up a storm at one of our weekly mobile pizza street food pitches! If I have learnt one thing from the Neapolitan pizza masters, it’s that a wood-fired pizza will only taste amazing if it is made using high-quality, fresh ingredients. Our zingy tomatoes are sourced from the volcanic soil and endless sunshine of Naples – the most delicious tomatoes in the world and the only option for true Neapolitan pizza! Our cheese is made by family-run Italian company Carnevale, using English milk and exquisite Italian expertise. We buy all our fruits and vegetables from Covent Garden Market, so that we can make sure they are fresh and locally sourced. And all our meat comes from British charcuterie Cannon & Cannon, whose produce is reared and cured in England for that unbeatable freshness and rich taste. As far as cooking spot-on pizza street food in London goes, a classic stone oven is a must. It gives pizza that classic Neapolitan flavour that just cannot be achieved with gas or electric alternatives. Our purpose-built wood-fired stone ovens produce an extreme dry heat that is essential for cooking a truly authentic pizza using age-old Neapolitan methods. As well as enabling us to achieve that rustic taste, it also means we can cook our thin-based pizzas in just two minutes! For people who want pizza at weddings or pizza caterers for a corporate event, this is ideal – no long waits, no hassle: just fresh, wood-fired pizza within minutes. To find out more about Neapolitan-style pizza street food in London, contact us at The Pizza Project today. If you don’t think our pizzas taste amazing (you will), we’ll eat our chef hats!